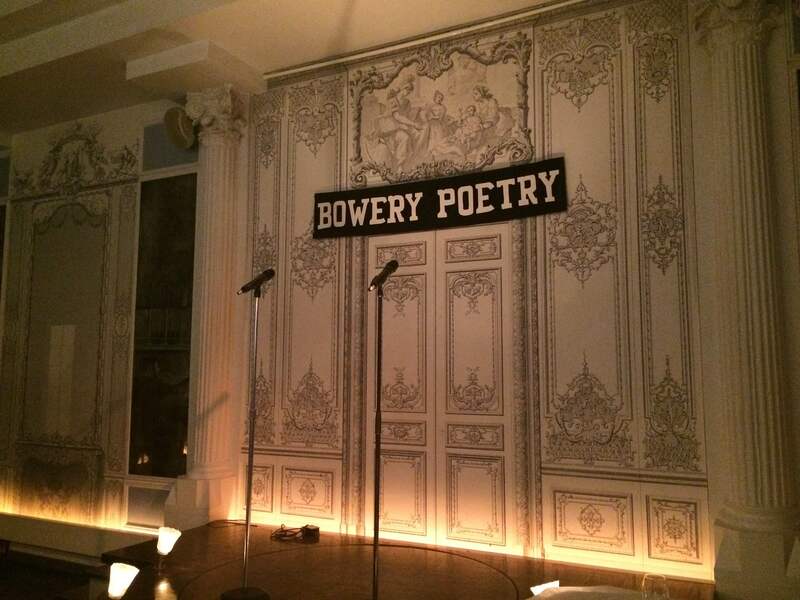 Every Monday night poets gather at 308 Bowery, not in a low-lit, dingy bar that one might expect for New York poets to hang out in, but in a room that has high ceilings, a glittering chandelier, and fancy French rococo-style wallpaper. The décor might seem too extravagant for the starving poets of the lower east side, but since its foundation by the American poet Bob Holman in 2002, this space—called The Bowery Poetry Club—has become one of the few places in New York where aspiring poets can come together and share their work. On Sundays and Mondays, poets and musicians take over the Burlesque stage. In 2012 the Bowery Poetry Club became a non-profit organization called Bowery Arts & Science. The space was renovated and rented out to a Burlesque club for 5 days of the week—hence the extravagant furnishings. Now, Bowery Poetry hosts open mics for poetry and music, as well as poetry workshops and reading nights. “It has weight to it, to be able to say, ‘I’m performing at the Bowery Poetry Club.’ It holds a prestige to it,” said Ariel Yelen, who works alongside Melnechuk as the community manager. On Monday nights, Bowery Poetry hosts “The Poet In New York,” which features a reading from a published poet—they have featured Eliot Weinberger, Forrest Gander, Eileen Myles, Adam Fitzgerald, and many more—followed by ten open mic spots. Not only does Bowery Poetry allow new poets to read their work to an audience, but it also provides a place for poets to meet other poets. “I think poets are masochists. They love a challenge, and they also are loners who are desperate to find people like them,” Melnechuk said. Becoming a non-profit organization has allowed Bowery Poetry to focus more on keeping poetry and the arts alive in the East Village, a place that has recently become too expensive for many art and cultural spaces. Bowery Poetry charges $10 at the door for most of their events, relying on ticket revenue and grants to be financially sustainable. Future plans at Bowery Poetry include starting a slam poetry team, creating poetry videos for the web, and possibly opening a pop-up space in Brooklyn.